"I'm warning you, when I get back, I'm doing an autopsy." Director Lucio Fulci's career has mainly been etched into cult-cinema for two reasons: gore and zombies. For years, there have been endless debates on which of his movies really constitutes his best legacy, and typically the most popular choice is The Beyond, Fulci's thematic continuation of his late 70s/early 80s supernatural zombie films. Like many Italian horror movies, The Beyond has been edited and renamed into oblivion, often released with major cuts or incorrect marketing. The film was recently completely restored with a new sound mix, in an effort to create a final, official version of the film that most accurately embodies the original cut. Anchor Bay finally delivers the home version of this re-release, and it has come just in time to spook you out for Halloween. The plot is extremely surreal and, at times, baffling. The film begins in the 20s, with the lynching of an artist living in a Louisiana hotel. The mob accuses the artist of bringing evil upon the land and they crucify him in the basement. Flashing forward into the 80s, we see a young woman, Liza Merril (Catriona MacColl), fixing up this same hotel in order to make it functional again. Unfortunately, a series of accidents seem to doom the hotel to instant failure, especially when a body is discovered in the cellar. Liza is then contacted by a mysterious blind woman who warns her that she should simply give up on the hotel, or else evil forces will be unleashed. Weirder things begin to happen and more people are killed off by supernatural zombies. A friend of Liza's, Dr. McCabe (David Warbeck), tries to figure out what's going on in town, but refuses to believe supernatural explainations. Are the 7 gates of hell really opening? Story-wise, the film revisits, a bit, City of the Living Dead. Once again a mysterious book (the book of Eibon) has foretold the opening of the gates of hell, which will cause the dead to walk the Earth—except this time, no one seems to know much about stopping it. Instead, the horror simply grow larger until it overtakes everything. Many plot elements aren't explained very well: these aren't necessarily flaws, but those who haven't seen The Beyond before should be aware that the film is very surreal and, essentially, never makes any cohesive sense. The important elements (atmospheric horror, weird characters, zombies, and loads of gore), are all accounted for and, frankly, I could care less about the plot development in movies like this. The Beyond is also one of the most extremely gory horror films I've ever seen. This is NOT a film for the casual filmgoer. Though it is a little slow to start, by the end of the film you'll have seen enough carnage to fill a truck or two. Most of the effects are pretty good for the time—disturbingly so. Lead actors Catriona MacColl and David Warbeck do a pretty admirable job of creating believable roles with such a weird and totally outlandish plot. Of course, Catriona MacColl has worked with Lucio Fulci before, most notably in City of the Living Dead, adding yet another layer of similarities with that film. I often find these Italian films have an amazing penchant for casting, with even small roles usually being filled by memorable faces or voices. From the creepy little girl, to the bizarre bookshop owner, these characters stick with you long after a viewing. I'll admit this is my first time watching The Beyond, other than seeing a few badly cut, crappy bootlegs. Now that the experience has set in, I have to say it's one of the best zombie movies I've ever seen. It's thick with tension, great "jump" moments, a wonderful score, and a definite visual flair. Assuming you're not put off by the blood and brutality, this is a fun ride for any horror fan. Image Transfer Review: Though age has taken a general toll, the restoration and transfer do this film well. No compression artifacts are visible and, despite the presence of some grain and scratches on the source print, the visual quality remains constant throughout. Black level is surprisingly accurate and crisp, adding to the improved quality. Image composition has been restored to its original 2:35:1 state and colors are also very natural and warm, making a dramatic change from previous releases. Audio Transfer Review: The new Dolby 5.1 soundtrack adds a surprisingly amount of dimension to the film. Lots of directionality from all channels has been added, even for minor dialogue. The surround channels are generously used for all sorts of ambient effects like dripping water, howling wind, and even some great moments of zombie moans making their way around the room. VERY unnerving to say the least, in a good way. Most of the dialogue is rooted in the center channel, but often the placement of onscreen characters effects the different channels it comes from. The music has been beefed up and the LFE channel carries a lot of good low-end, especially from impact noises (bullets, etc..) And additional Dolby 2.0 soundtrack has been added, but it really doesn't have the same kind of fun with the audio. It is pretty good, though, and if you prefer 2.0, it still carries much of the same ambience and directionality. The original English and Italian language mono soundtracks have also been included for audio purists, and although very flat and lifeless compared to the 5.1, they are the originals. German Color version of pre-credits sequence. Extras Review: The extra material is headed up by a commentary track featuring actors Catriona MacColl and David Warbeck. I presume the commentary was recorded prior to 1997 since Warbeck died that year, but regardless, the commentary is absolutely wonderful. MacColl and Warbeck have an amazingly lighthearted attitude about these gory horror films they worked on and, unlike many actors who "moved on" from that sort of thing, appreciate the cult fanship their work has received. Filled with humor and personality, the commentary is more like an episode of Mystery Science Theatre 3000 than an analytical view of the film. They make fun of their own performances, joke about their work with Lucio Fulci, and poke fun at the film every chance they get. They do get serious here and there, but for the most part they have a lot of fun with it. Fans will adore this commentary. "Images From The Beyond" is a sort of featurette that compiles all of the bonus material on the disc into one unit that can be watched like a movie. All sorts of stuff is featured, from Beyond posters in other countries to the myriad of box art from the numerous VHS cuts of the film. Short interview snippets with Catriona MacColl, David Warbeck, and Lucio Fulci are presented, taken from footage shot at a horror film convention. Another short interview with Fulci is taken from an on-set discussion when he was filming Demonia. All of this material is indexed so it can be separately viewed, if you wish. Though the movie's early moments are in a sepia-toned, black-and-white footage, the German release had color for the opening sequence, and that footage is found on the disc as well, complete with German Mono soundtrack. A music video from the death metal group Necrophagia is presented, with their song And You Will Live in Terror, inspired by the film. All of this is topped off with the original trailers (including the re-release trailer) and marvellous menus, themed very well to the movie's events. Although the film is only 87 minutes long, there are an astonishing 53 chapter stops, many of which reflect a humorous attitude towards the film (one chapter stop called 'DO NOT ENTRY' references the sign in a particular scene). The keepcase insert is a reproduction of the original Beyond posters, and was also the poster used for the theatrical re-release. 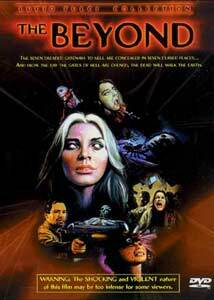 It should be noted that The Beyond is also being published in a limited edition version in a tin case. That version will feature all of this material as well as a 40-page booklet and 6 full-size posters. Anchor Bay earns another gold star with their treatment of this cult classic, a treatment that fans would probably not have gotten anywhere else. Whether you spring for the limited edition or just get the standard, you'll be well pleased with this archival package that pays great tribute to Lucio Fulci. It's a shame he couldn't live to see it. This would make a great Halloween gathering film, but make sure you keep some barf bags around. After all, home theatre equipment doesn't react well to that sort of thing. Highly Recommended.